Agricultural Law: The Fuel Cost of Fuel? Some attention has been paid of late to the fuel cost of food. By this measure, critics mean to draw attention to the number of fossil fuel calories consumed not only in producing the food (primarily in the form of fossil-fuel based fertilizer) but also the fuel costs of getting food from the fields of Iowa, or California, or Argentina, to consumer's plates. The local food movement emphasizes the fuel cost of food as a way to encourage folks to eat locally. University of Minnesota scientists recently took a different angle, and took a stab at calculating the fuel cost of fuel. Specifically, the U of M researchers considered whether producing ethanol from corn requires more energy to produce than it delivers. 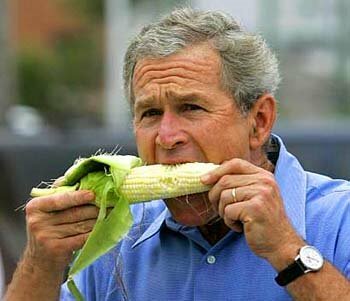 (If so, we should just feed it to President Bush, and forget about corn as a source of ethanol). Good new (initially anyway) for ethanol boosters. The Minnesota researchers determined that ethanol produced from corn delivers 25% more energy than it costs to produce. The good news, though, is tempered by the reality that even if all of our corn crop was dedicated to ethanol, we would offset only about 12% of our gasoline usage. As recent commentators have pointed out, switchgrass or mixed prairie grasses offer a better alternative. 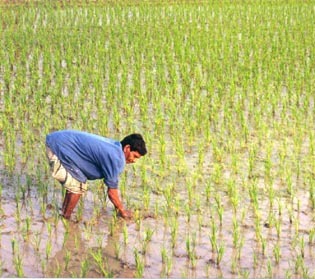 Since both can grow on marginal land with minimal fossil fuel-based inputs. U of M researchers included Jason Hill, David Tilman, Stephen Polasky, Douglas Tiffany and Erik Nelson.